GraphMax with some breakfast cereal truth! It's interesting that, in economics and in religion, there are natural and artificial "barriers to entry". In econ, there are natural barriers to entry, for example, in terms of the fixed costs to begin production and get product/service to market. There are often artificial (govt) barriers-- various regulatory impediments-- which diminish productive activity in that realm, often at the behest of those who benefit from restricted competition. Examples run the gamut from labor unions to govt's monopoly on elementary and secondary education, from trade protectionism to all sorts of shenanigans in farming. In religion, there are natural barriers to Christianity. The crucifixion of Jesus was a stumbling block to Jew and Greek (I Cor 1:23). More broadly, commitment to Jesus can be a stumbling block as people want to go their own way instead (e.g., Is 8:14, Rom 9:33, I Pet 2:8). But we are not to put artificial stumbling blocks in the way of those who are not yet in the Kingdom (e.g., Mal 2:8, Rom 14:20, I Cor 8:9, 10:32, II Cor 6:3). The most famous passage on this occurs in this passage and focuses on the concept rather than the term: Mt 23:13. Kyle talked about how we can set up stumbling blocks within the practice of the faith-- in particular, by turned good things into duties, from "get to's" to "need to's". He cited small groups, gender-specific Bible studies, mission trips, affinity to a Christian sub-culture, and a particular political agenda. All of these (and others) are-- or at least can be-- (quite) good. But all of them can lead one, ironically, from abundant life in Christ. Religion over relationships, minors over majors, associating rules with Lordship. That's not the way it's supposed to be! If that has been your experience of Christianity, open your mind to finding a new church, open your Bible to the Gospels and to Paul's writing (particularly in Galatians and Colossians), and most important, open yourself to a loving God who wants you to have eternal and abundant life starting right now. silly and knowledgeable stuff at PageOne about "global warming" and its "denial"
It’s interesting how many on this board are the first to point out the corrupting influence money has within the university system (see: Felner et. al). However, they somehow see to insulate science researchers from the same influences. Now I not saying they are all corrupt, they’re not, but to say they have no political or financial biases, is dishonest. What we need is a blind funding mechanism for science that takes the desire to please the grant givers out of the process. Then, he cites this speech by Michael Crichton to the National Press Club in January 2005 and compares Crichton favorably with Gore. Mammograms are the second, visible example of the new rationing battle. Under the current arrangement-- heavily subsidized and regulated insurance-- the frequency of covered mammograms is determined through a calculus determined by insurance companies and consumers through employers. This may not be the ideal (since the govt intervenes so heavily here), but given the importance of the test, the disease, etc., it's probably close to optimal despite the govt intervention. Under the proposal for an even-heavier hand for govt in health care and health insurance, some combination of higher costs and more rationing must follow. When the govt starts making decisions, we can hope for a wise and disinterested cost/benefit analysis. But interest groups would be expected to have more pull. And in any case, more rationing is inescapable under the current efforts to extend the highly-flawed status quo coverage to more people. In the course of one day, I came across five essays in my daily reading: a story by Laura Ungar and Darla Carter in the C-J, an interview by Ungar with Megan Schanie (whose battle with breast cancer was captured in a long C-J series), an op-ed by Eugene Robinson-- a syndicated columnist in the C-J, a WSJ editorial, and an essay from a friend. ...the United States Preventive Services Task Force changed their recommendation for mammogram screening for 40 – 49 year old women changing it to a “C” on the scale of tests to be complete and breast self-exam teaching to a “D” on their scale. In the current Healthcare Reform legislation passed by the House of Representatives (HR3962), the only tests that will be covered are “A” and “B” tests as recommended by, you guessed it, the United States Preventive Services Task Force. Mammograms do not gain the “A” or “B” rating until women are 50 years old and then only every two years. Ideally, these decisions would come through the market-- here, between health insurance companies and consumers. Insurance companies might want more testing to catch disease earlier. Or perhaps they'd be indifferent, given the cost/benefit. Or perhaps some consumers would want more testing-- and would willing to pay for it. The market can handle such things AND would provide flexibility from both the perspective of insurance providers and consumers. When the govt rations, there is little if any such flexibility. The uproar over the on-again, off-again guidelines on when women should have mammograms is proof of the blindingly obvious: Health care reform that actually controls costs — rather than just pretending to do so — would be virtually impossible to achieve. I say “would be” because none of the voluminous reform bills being shuttled around the Capitol on hand trucks even tries to address a central factor that sends costs spiraling out of control, which is that each of us wants the best shot at a long, healthy life that medical science can offer. Just as all politics is local, all health care is personal. Skimping on somebody else's tests and procedures may be worth debating, but don't mess with mine. Intellectually, it's simple to understand why it might make sense for women — those who have no special risk factors for breast cancer — to wait until they're 50, rather than 40, to start getting mammograms. The analysis by the U.S. Preventive Services Task Force, which made the recommendation, looks sound. According to the panel, a whopping 10 percent of mammograms result in false-positive readings that lead to unjustified worry and unneeded procedures, such as biopsies. In a small number of cases, women are subjected to cancer treatment or even a mastectomy they didn't need. This harm, the task force reasoned, outweighs the benefits of discovering a relatively few cases of fast-growing, life-threatening breast cancer in women in their 40s through annual mammography. It is also true that waiting to begin regular mammograms until a woman reaches 50 — and reducing the frequency to once every two years, as the task force recommended — would save a portion of the more than $5 billion spent on mammography in the United States each year. continuing the dialogue with "Dialogic"
1.) OK, maybe we'll chat about econ down the road. 2.) You're into dialogue, right? 3.) You prefer to conflate the two? Why? 4a.) Neither of us is an evolutionary biologist. But it should be easy enough to provide a bunch of explanations from that field-- about the development of reproductive and vital organs-- if they existed. 4b.) You seem to be focused on young-earth creationism. Why are you conflating that with old-earth creationism? Are you (equally) unimpressed by both? 5.) Both the theist and the atheist rely largely on narrative rather than explanation. All forms of Creationism say, in essence, that "God did it". All forms of Evolutionism say, in essence, "Evolution did it". (So far, you've said Evolution did it and I have faith in the evolutionary biologists who tell the story.) Neither can explain or document exactly how this happened. The Creationist more or less owns up to this and recognizes the faith he places in that story. The Evolutionist is more prone to illusion about what he knows and is strangely allergic to his inescapable faith. You may have heard something about the sad story of Bill Sparkman and the decision yesterday to rule his death as suicide rather than murder (presumably by wingnuts). Apparently, he hoped to have his beneficiaries collect on life insurance policies worth $600K. Then this from Barefoot and Progressive (although they are neither all that progressive nor barefoot)-- declaring that wingnuts are "relieved". Of course, the flip side of that coin is that moonbats are disappointed. spare the ears; spoil the child? Many in today's soccer-cheering, organic-snack-proffering generation of parents would never spank their children. We congratulate our toddlers for blowing their nose (“Good job!”), we befriend our teenagers (literally and virtually), we spend hours teaching our elementary-schoolers how to understand their feelings. But, incongruously and with regularity, this is a generation that yells. Numerous studies exist on the effect of corporal punishment on children....But there is far less data on the more common habit of shouting and screaming in families. Psychologists and psychiatrists generally say yelling should be avoided. It's at best ineffective (the more you do it the more the child tunes it out) and at worse damaging to a child's sense of well-being and self-esteem. Rohner gets to the key point at the end: how the discipline is taken by the child. As with other forms of communication, both parties-- but here, especially the adult-- bears responsibility for how well the communication works. In producer theory, we talk about scale and substitution effects from a change in the price of an input into production. For example, if the price of labor increases, then the scale effect is that production becomes more expensive, leading to some combination of higher prices for consumers and reduced output (and input use) by the producer. The substitution effect is that other inputs become relatively attractive-- and so, here, firms will substitute as possible from labor toward capital and other input options. In this context, one could consider spanking and shouting as two inputs to the production of higher-quality children. One might easily assume that both can have positive input on that output-- but that too much would face diminishing and eventually negative returns. If spanking becomes more "expensive"-- here, because it is socially and sometimes legally more costly-- then we can predict that parents will substitute toward other inputs and that they will find it more difficult to produce higher-quality children. Of course, if one assumes that spanking or shouting is always a bad input, then one would conclude that eliminating the input might even improve quality. The social and political question, then, is whether one would enshrine those assumptions in a paternalistic public policy which tries to dictate how a parent can discipline their own children. There was a lot of stink this weekend about the NFL's overtime policy. It's "sudden-death"-- and often results in a win for the team which wins the coin flip to determine who gets the ball first. -The first team to score 6 points in the overtime would win-- or after 15 minutes, the team with the lead would win. -Or you could insist on playing an entire 15 minute period and see who's leading then-- with two 7.5-minute "periods". As a variation on this, you could have a rule that after the first touchdown in the OT, subsequent touchdowns would require a two-point conversion attempt. OK, next week, I'll fix the BCS. markets and morality in China OR China as a future "city on a hill"? Zhao, who lives in Beijing with his wife and two daughters, professed Christ in 2004 but remains a member of China's Communist Party...still a professor of economics at Beijing Polytechnic University and a commentator on government-run China Central Television. ...Zhao can be such an outspoken Christian in a communist country in part because he has worked at the highest levels of government and shown that he is no threat to the authorities: A dissident with the same views would not have so much freedom...Because Zhao is not challenging the Party, officials allow him to show that Christian ideas will benefit Chinese society. [He believes that] It is the blessings of the 'transformation with the Cross' that will bring China sustainable society and economic development." If this happens, he believes China could enter another Golden Age of world prominence with its success based on Christianity instead of Confucianism or Taoism. He likens this possibility to a Chinese "Great Awakening," with China itself the new "city on a hill." Has anyone seen the movie yet? It's based on the Michael Lewis book by the same name. I enjoyed Lewis' work in Moneyball. The article summary: "All-American Michael Oher went from the streets as a 15-year-old son of a crack addict to potential NFL Rookie of the Year on the love and dedication of an adoptive family that wouldn’t let him fail." As Henry notes at the end of her article, it's interesting and providential that the movie debuts on the weekend of National Adoption Day. Sounds like a good idea to support the movie and celebrate the day! Hair tucked into a surgical cap, eyes hidden behind thick-framed magnifying glasses, Devi Shetty leans over the sawed open chest of an 11-year-old boy, using bright blue thread to sew an artificial aorta onto his stopped heart. Dr. Shetty...offers cutting-edge medical care in India at a fraction of what it costs elsewhere in the world. His flagship heart hospital charges $2,000, on average, for open-heart surgery, compared with hospitals in the U.S. that are paid between $20,000 and $100,000, depending on the complexity of the surgery. Then there are the Cayman Islands, where he plans to build and run a 2,000-bed general hospital an hour's plane ride from Miami. Procedures, both elective and necessary, will be priced at least 50% lower than what they cost in the U.S., says Dr. Shetty, who hopes to draw Americans who are uninsured or need surgery their plans don't cover. Cardiac surgeons at Dr. Shetty's hospitals are paid the going rate in India, between $110,000 and $240,000 annually, depending on experience...Dr. Shetty was paid almost $500,000 last year, according to the group's audited financial statements. why are the Senate Dems attacking HSA's? Even if you want to implement health care for those who don't currently have it, what's the point of sacking HSA's? Often, I can put myself in the shoes of those with whom I disagree. But when I'm dealing with statists, it's difficult to deal with their blind, anti-progressive, fundamentalist, and destructive faith. Unless I'm missing something, this is one of those occasions. These insurance products will likely be barred from the insurance "exchanges". When Alabama Congressman Artur Davis voted against the health-care bill that passed the House earlier this month, he probably expected some grief from fellow Democrats. But he couldn't have anticipated being accused of selling out his race. Mr. Davis was the only black Member to oppose the legislation, and his vote earned him a rebuke from Jesse Jackson at a Congressional Black Caucus Foundation reception Wednesday night. "We even have blacks voting against the health-care bill," said Mr. Jackson. "You can't vote against health care and call yourself a black man." ...The Congressmen, to his credit, took the high ground in response to Mr. Jackson's low blow. "One of the reasons that I like and admire Rev. Jesse Jackson is that 21 years ago he inspired the idea that a black politician would not be judged simply as a black leader," he said in a statement referencing Mr. Jackson's 1988 Presidential bid. "The best way to honor Rev. Jackson's legacy is to decline to engage in an argument with him that begins and ends with race." ...Even in the age of a black President, too many liberals still believe they have more to gain from identity politics than from a post-racial America. From Speed Bump with some providential timing, given my recent posting on this rap video! The Big East started with 41 wins in a row, before Providence lost to Alabama last night. South Florida followed that with a loss to South Carolina. So they're on a two-game losing streak now-- and both against the SEC! They beat up a variety of lesser teams, but had a few impressive wins, including last night's beat-down by Syracuse over North Carolina. Does it matter if the stealing reveals the lying and cheating? Do the ends justify the means (here)? What a weird ethical dilemma! My friends who are fans of science are fond of saying that science corrects itself. But that's not exactly what we have here. This is not Science in academic journals and rigorous debate, but science-flavored hacks vs. emailed hackers. In any case, Science corrects itself; science doesn't necessarily. Anyway, (some of) it is out. And it relates to the missing data scandal I posted on earlier this week. Hat tip to Chris Lang and Randy Baker for pointing to the NY Times article by Andrew Revkin this morning. UPDATE: This controversy was later nicknamed "ClimateGate". Puritanical advice for the unemployed at Thanksiving? With Thanksgiving just around the corner, encouragement [for the unemployed] may come from an unexpected source: the Puritans. Why should we take money from people in Michigan and New Jersey to pay for our convention center? If we want it, we should pay for it ourselves. Or if we're going to extract money from others, why not at least from fellow Hoosiers? Maybe Terre Haute should ante up for us? The Treasury Department has rejected Jeffersonville’s request for up to $25 million in tax credits intended to jump-start redevelopment of the city’s aging downtown with a convention center and hotel just across the Ohio River from downtown Louisville. In the meantime, Galligan said, the city is focusing on another plan: a 1.3-mile canal through downtown that would be up to 40-feet wide in places. It would help drain storm water from flood-prone areas while providing a scenic setting for restaurants, shops and other development. Based on preliminary estimates, the mayor said, the canal could cost $50 million but might be funded with state and federal money for drainage and environmental projects. What's his obsession with using other people's money to pay for his stuff? “It will be a bigger challenge” without the credits. If it's worth it, then hopefully, he'll be up to the challenge. If it's not worth it, then it should fail of its own accord. Children born in the winter months already have a few strikes against them. Study after study has shown that they test poorly, don't get as far in school, earn less, are less healthy, and don't live as long as children born at other times of year. Researchers have spent years documenting the effect and trying to understand it. But economists Kasey Buckles and Daniel Hungerman at the University of Notre Dame may have uncovered an overlooked explanation for why season of birth matters. Their discovery challenges the validity of past research and highlights how seemingly safe assumptions economists make may overlook key causes of curious effects. And they came across it by accident. In 2007, Mr. Hungerman was doing research on sibling behavior when he noticed that children in the same families tend to be born at the same time of year. Meanwhile, Ms. Buckles was examining the economic factors that lead to multiple births, and coming across what looked like a relationship between mothers' education levels and when children were born. Other researchers have suggested other reasons for season-of-birth differences. Maybe vitamin D was playing a role, for example, because children born in the winter were getting less sunshine in early life. Or maybe being put in the same school year with children who are mostly younger makes children born in the winter less socially mature. A study published in the medical journal Acta Pædriatica in April found that children born in the winter have higher birth-defect rates and suggested it was due to a higher concentration of pesticides in surface water in the spring and summer, when the children were conceived. Ms. Buckles and Mr. Hungerman aren't entirely sure yet. Perhaps it has to do with fluctuations in employment; married women tend to conceive when unemployment is higher, research has shown. They also speculate it might be due to cooler temperatures in springtime, which don't adversely affect the fertility of poor parents, who may not have air conditioning, like hot temperatures do. Or they wonder if there might even be a "prom" effect at work. January is, after all, about nine months after many of those soirees. The "War on Poverty" started in 1964 - you have had 45 years to get it right; more than $1 trillion of our money has been transferred to "the poor"; it hasn't worked and our entire country is broke. The punchline: The 74 counties with half of the nation's bad roads will split $1.9 billion, records show; counties with no major roads in bad shape will split about $1.5 billion. Kentucky received none (at least through August 28th). if we're measuring outcomes in health care, why not government-run education?! Why didn't I think of this before?! America has had a comparatively high infant mortality rate since we've been measuring these things, going back to at least the '20s...long before European countries adopted their cradle-to-grave welfare schemes and all while the U.S. was the wealthiest country on Earth. We also count every baby who shows any sign of life, irrespective of size or weight at birth. By contrast, in much of Europe, babies born before 26 weeks' gestation are not considered "live births." Switzerland only counts babies who are at least 30 centimeters long (11.8 inches) as being born alive. In Canada, Austria and Germany, only babies weighing at least a pound are considered live births...By excluding the little guys, these countries have simply redefined about one-third of what we call "infant deaths" in America as "miscarriages." In his article on "Flawed Climate Data," Ross McKitrick tears apart the last remaining Climate Hockey Stick analysis, stripping all the Global Warming hype to nothing. I have been probing the arguments for global warming for well over a decade. In collaboration with a lot of excellent coauthors I have consistently found that when the layers get peeled back, what lies at the core is either flawed, misleading or simply non-existent. The surface temperature data is a contaminated mess with a significant warm bias...Climate models are in gross disagreement with observations, and the discrepancy is growing with each passing year....The IPCC review process, of which I was a member last time, is nothing at all like what the public has been told: Conflicts of interest are endemic, critical evidence is systematically ignored and there are no effective checks and balances against bias or distortion. 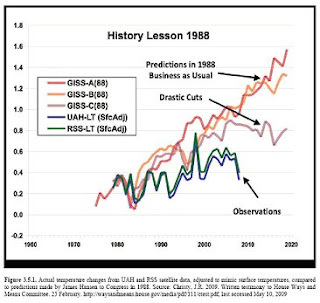 All you really need to know is that many of our representatives still listen to what James Hansen has to say even though his 1988 prediction, in the graph at the top, tells what his analysis is worth. Actual temperature levels entering 2010 are trending completely opposite of his predictions and temperatures are lower today than if we had actually crippled our economy and taken his drastic recommendations back in 1988. They have two other "experiments" at their website too. Check it out! tighty-whities OR pull up your pants dude! Part of me wants to walk up to Mr. Low-Pants and tell him to get radical like some did back in the day. You know, in the 1970s, it was common for people to take off their pants and run around. Now, these "rebels" pull down their pants a few inches and think they're something special. C'mon, if you're serious, pull them down around your ankles or just take them off! Hey, if they can't take care of this, why would one expect them to be great at Cash for Clunkers, economic "stimulus", or health care/insurance? ...worried about the government’s ability to count....How bad is it? Let me count the ways. Actually, I will only count a few ways because there are far too many, one could even say countless, examples to fit within my limited word count. Besides, if any government officials are reading this, I wouldn’t want to confuse them with too high a number. So I’m going to share three, one example from each layer of government: federal, state and local. OK, let’s move down to a state level counting requirement. Did you know that for a long time Indiana’s government schools claimed that one-half is equal to one? In the past, when school was in session for a half-day, it was counted as a whole day. But then, the new Superintendent of Public Instruction, Tony Bennett, decided they better use the same math most of us use in the real world so he changed the rule. I’m not sure it really makes much difference though. The number of days of compulsory attendance required tells us nothing about whether a child is actually learning anything, besides counting down the days to the end of the year. Finally, thanks to local citizen and soon-to-be forced Jeffersonville resident Bruce Herdt, we have a local example. He discovered the possibility of a huge mistake in the count of homes involved in Jeffersonville’s annexation. The mistake could number in the thousands, which I find amazing. After all, a house is a pretty hard object to miss when counting. Most preschoolers with just a few hours of Sesame Street under their elastic waist should be able to count something as big as houses without messing up too bad. I don’t know, maybe someone can do something to help these people get better at performing such elementary tasks. But I’m not counting on it. An eye-opening documentary called Not Evil Just Wrong: The True Cost of Global Warming Hysteria is being released this week by the Cornwall Alliance for the Stewardship of Creation—an outfit I endorse. I dare say the film will be controversial because it tackles head on the sacred cows of the man-made global warming crowd. The film points out that the British High Court ruled in a lawsuit that Al Gore’s movie, An Inconvenient Truth, “is scientifically flawed and has nine significant exaggerations and factual errors.” Among those exaggerations are the claims that sea levels could rise 20 feet by the end of the century, and that polar bears are disappearing because of global warming (in fact, they are not). So why should we care about all the global warming hubbub? If the so-called “solutions” to global warming being bandied about by the U.N. and Congress are put into effect, they could severely damage the U.S. economy and absolutely devastate the economies of the world’s poorest nations—potentially endangering the lives and livelihoods of millions. All in response to a faulty premise. Now that is a truly alarming claim. But I believe the film—half of which is devoted to the human and economic consequences of buying into global warming—makes the case persuasively. Actually, the title is too kind in that some things that occur in the name of global warming are clearly evil-- in terms of intent and outcome. "the dog that ate global warming"
Putting together such a record isn’t at all easy....the weather data that go into the historical climate records that are required to verify models of global warming aren’t the original records at all. Jones and Wigley, however, weren’t specific about what was done to which station in order to produce their record, which, according to the IPCC, showed a warming of 0.6° +/– 0.2°C in the 20th century. It's interesting that some of my global warming friends are chief among those who insist on the practical efficacy of the scientific process! Then the story changed. In June 2009, Georgia Tech’s Peter Webster told Canadian researcher Stephen McIntyre that he had requested raw data, and Jones freely gave it to him....McIntyre was told that he couldn’t have the data because he wasn’t an “academic.” So his colleague Ross McKitrick, an economist at the University of Guelph, asked for the data. He was turned down, too. religion and natural selection; why are Darwinists bothered by religion? On this 200th anniversary of Darwin’s birth, I am amazed that there is still the ongoing conflict between science and religion. A couple of years ago the president of Harvard wrote an editorial for USA Today saying that religion and science should go their separate ways. Politicians used to talk like that too. Not anymore. Gandhi once observed that “he who says religion and politics don’t mix, understands neither one.” Science ignoring religion is like a biologist ignoring the ocean. Thank God, religion didn’t feel that way or science and yes, even Harvard, which was born in the midst of a religious revival, would not exist. Scientists often ask for physical discernable proof of the spiritual world and actually, something physical does happen when people believe they encounter God. The brain chemistry changes, there is the release of endorphins and an adrenalin rush, there is often an emotional response. Let us assume for a moment that this brain chemistry, which affirms the beliefs of a person, is all physical and developed out of some evolutionary, societal need. Then this too, is wonderfully complex. It means that man evolved to the point that he developed a belief in God and furthermore, knowing that God did not really exist, and was an invention for evolutionary purposes, has hidden that fact from himself. That is, man had to lie to himself about God and it had to be so good, so convincing, so deep, so personally affirmed by internal evidence, that even a Harvard science professor couldn’t kill it. So, if this is so, why should science reject what evolution itself has done? Does it not have a purpose? Hmmm, it is so exhausting. It is so much easier to believe in God. Although I appreciate the fresh "textbook" examples of why government spending is ineffective for restoring economic health, it's been a disaster for the macroeconomy as well the millions of lives drastically impacted by the stupidity. Now, Obama wants to reduce the stimulus-- so he can, what? Increase it later or pass health care or who knows...What a joke! The Obama administration, under pressure to show it is serious about tackling the budget deficit, is seizing on an unusual target to showcase fiscal responsibility: the $700 billion financial rescue. The White House is in the early stages of considering what bigger moves it might make for next year's budget. The Office of Management and Budget has asked all cabinet agencies, except defense and veterans affairs, to prepare two budget proposals for fiscal 2011, which begins Oct 1, 2010. One would freeze spending at current levels. The other would cut spending by 5%. Not sure we'll ever see that. But politically, that'd be a lot smarter than what the GOP did in the 1990s-- fighting for reduction in spending (from, e.g., +8% to +7%) and getting hammered for "spending cuts"! It's not a great book, but this slim volume co-authored with his wife has some little gems in it. "God does not approve ruts; He does sanction tradition. It is a cohesive glue to hold us together, to help provide security in a fragmented world." The intro to counsel he provided to a man who was struggling: "I could be wrong, but my evaluation of you is this: You are a ten-cylinder man operating on about three and comparing yourself with others who have only two." On counseling: "Counselors can often be cowards, not caring enough to confront....A former pastor told me about his experience of sinking into an illicit sexual relationship. He said he felt like an exhausted swimmer battling a pounding surf, unable to escape the strong undertow, about to go down for the last time. On shore he could see all the people of his church. Some were shaking their heads in weeping and despair; others were shouting and shaking their fists in anger and frustration. There were words of encouragement and gestures of good will...[But] only one man stepped forward and risked everything to plunge into the water and help the victim to safety. Am I willing to be that man?"